The 3M� DBI-SALA� Adjustable Wristband with Cord is constructed out of elastic webbing that can be adjusted to virtually any wrist size. 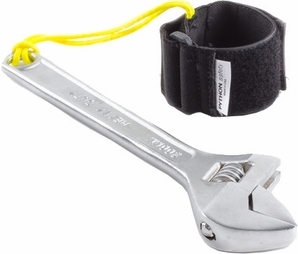 Tools can easily be tied off to this wristband using sewn-in cord. A hook and loop strap combined with an elastic strap allows this wristband to adjust to virtually any wrist size. Easily tie off most small hand tools by cinching to sewn in paracord.